The US general who led the invasion of Iraq says he believes foreign troops may have to remain in the country for a further three to five years. Retired General Tommy Franks told BBC's Newsnight programme he believed that would be the time it took for Iraqis to take full control of their country. He said US-led troops would have to stay in Afghanistan for a similar amount of time. But he said that did not mean troop levels would have to remain as high. "I think in Iraq the total process, until Iraqis are as firmly and fully in charge of their country as they would want to be, is three to five years," he told Newsnight. "That doesn't mean we will see the level of 10,000 Brits and 140,000 or so Americans for the next two to four years." He also defended the Iraq and Afghanistan invasions, saying that terror groups no longer had "sanctuaries" there. The retired general praised US President George W Bush's for showing "pretty good leadership" during the couple of tough years. But he attacked what he described as the Washington bureaucracy, saying it sometimes reminded him "cats fighting in a sack". 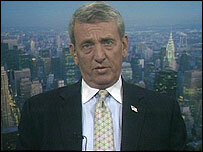 Tommy Franks, who also commanded US forces during the invasion of Afghanistan in 2001, has released his memoirs this week. In the 590-page "American Soldier", he describes his childhood in Oklahoma and his 37-year military career. He gives a detailed account of the US war on terrorism and says his greatest surprise was that the former Iraqi leader Saddam Hussein did not use weapons of mass destruction in the early stages of the war. His criticisms of top Pentagon aide Douglas Feith - who he said was "getting a reputation.. as the dumbest guy on the planet" - were dismissed by Defense Secretary Donald Rumsfeld on Thursday. Mr Rumsfeld said Mr Feith, who is under secretary of defense for policy, was a "rare talent" and called Gen Frank's criticisms "kind of strange". In his memoirs, Gen Franks says that four days before the 9/11 attacks he told his staff his greatest fear was "a terrorist attack against the World Trade Center in New York".